After the chairmans speech, Ali Baba, the grand comedian of the Federal Republic, who also came in majestically with his wife was called upon to conduct the first feeding of the husband by his wife. The last leg of the event saw Dr. Ajayi danced with his daughter, while the groom, Femi danced with his mother,Mrs Adeniyi. It was followed by the couple’s first dance, before the parents of the couple were invited to dance with them. And the vote of thanks was given by the groom. Oba (Dr). Adetoye Alatise Chief Oye Balogun, Alibaba & his wife, Chief Femi Odutola, Niyi Ojuolape (United Nations), Opeyemi Odeyale, Babalola Adefarati, Chief (Dr.) Adedayo Ajibulu, Mr. Folorunso Okunoye, Chief (Mrs) Ajoke Akingbade, Mr. Bolude Owele, Deaconess Funke Adeniyi, Prof Olu Adejuyigbe, Chief (Mrs) Adetula and Otunba Ola Oluwanisola. B & C Fabs planned/managed the event, *Lash Palms Limited, Golden Solution Security Ltd, provided tight security. * Beyond Tastee Caterers, The Dessert Studio for Desert, Cupcakes Candy Bar, and Chocolate Fountain, Drinks Division took care of cocktails, drinks e.t.c. 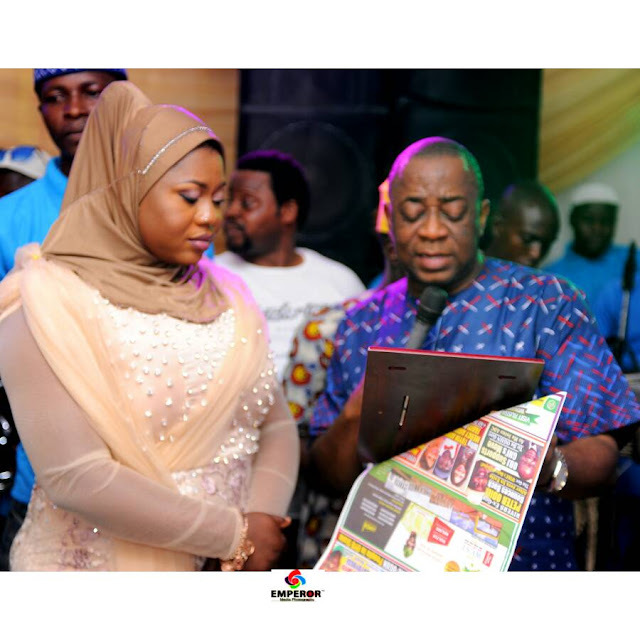 The engagement was witnessed by a large turnout of guests despite the fact that it took place in Lagos. Most guests came in from Ile-Ife and other neighboring states. The Engager did her work very well and made sure all went according to the programme. There was exchange of letters between the 2 families, cutting of the engagement cake, the couples looked radiant in their choice Aso Oke and also the Aso-Ebi for the engagement. Shade’s of mint and teal green for brides family and margenta and silver for groom's family were spotted by many guests. The engagement was on Thursday,14th of December at Havilla Event Centre, Victoria Island. The holy solemnisation of the couple's union was at Pastor Ituah Ighodalo-led Trinity House Church, Victoria Island.The service started at exactly 10.00am in the presence of both families and all other guests. The Pastor in- charge of the ceremony was the senior pastor himself. He coordinated the event very well and all the activities took place at the stipulated time. The couple were joined and there was a special rendition by the choir for the couple. One thing that was very conspicuous at the reception was the couple's gazebo and the white aisle.From the entrance of the hall to the couples's stage that was beautifully decorated in different shades of burgundy, margenta which belong largely to the Violet family. The Gazebbo was majestically structured with a wide aisle, buoyed with shimmering lights and loads of over 200 natural flowers to sit the couple. It wowed all guests as they gave kudos to the company in charge. Gone are the days when people picked regular colours for their wedding, it was not so at the nuptials of Tosin and Femi. The colour code was unique and beautifully combined . The colour code for the engagement day was Mint and Teal green while for the groom, it was is Margenta and silver. The wedding day colour code was blush and burgundy. Both combinations were very prominent in all the guests attire even couple’s parents looked nice in their choice of Peach and royal blue handcut aso oke attire. It was a beautiful colour combo all the way. The aso ebi, which was all blush for men and women was spotted by most guests. They all looked ravishingly gorgeous in their different style. At the party were almost all the members of staff of Nordica fertility Centre. They wre there to support theirboss and his wife. 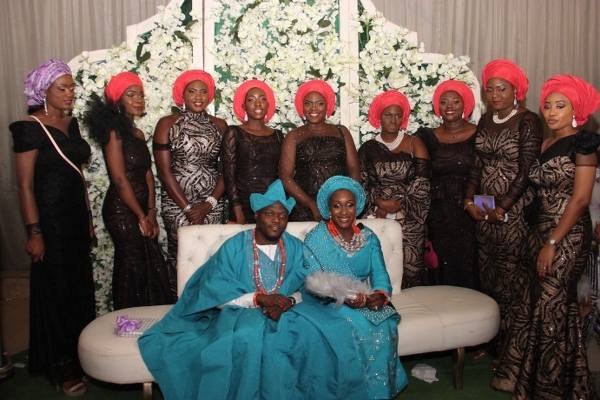 They also wore the aso ebi for the day and were seen attending to guests to ensure they were well catered for. At the engagement and wedding ceremony were the 2 society women, who make party tick. They share a close family friendship with the Ajayis and thus honoured them at their daughter’s wedding. Princess Toyin Kolade, big time businesswoman stormed the engagement in her usual white colour,,, while celebrity shoe designer, Montai, was at the wedding.